A great story to work with here. 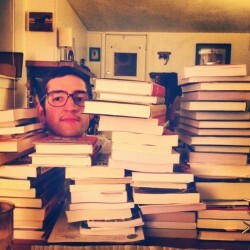 Sometimes we all need to read something that just feels a little good. 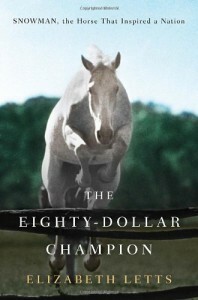 In all honesty, you could just look at the cover on this--The Eighty-Dollar Champion: Snowman, The Horse That Inspired a Nation--and have a good gist of what is in store for you. However, I enjoyed going deeper into the history. There is a lot of heart, determination, and communication that goes into a sport like horse jumping, so it is nice to read about those times when a rider and a horse can just use these simple tools to take a championship without having to tack them to a checkbook (horse pun!). The writing is really nothing to speak of. Repetitive, predictable, and all very matter of fact. Not that author, Elizabeth Letts, really has anything she needs to be doing other than making it readable, but compared to other non-fiction I've encountered with this type of format there is no real style. I'm also a little baffled on the heights of all the jumps. At Grand Prix events these days you aren't going to find horses doing clean rounds over several 6ft. oxers, but maybe they just threw horses over them back in the 1950s with no real regard to the safety of anyone or anything. I'd recommend this if you're looking for a nice easy read, if you have a horse, if you have any interest in horses, or if you happen to have a significant other that rides horses. I also imagine that if you have any literate horses in your present company then he/she would enjoy this one too. At the very least it is a book that can really help you out with learning some horse knowledge and lingo.